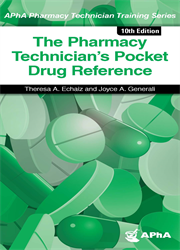 Small and light enough to carry comfortably in a lab coat pocket, the completely revised new edition of The Pharmacy Technician’s Pocket Drug Reference contains the five main pieces of drug information that a pharmacy technician seeks. Regardless of their practice setting, pharmacy technicians will find the Pocket Drug Reference current, dependable, and useful. Small and light enough to carry comfortably in a lab coat pocket, the completely revised new edition of The Pharmacy Technician’s Pocket Drug Reference contains the five main pieces of drug information that a pharmacy technician seeks. For each of the most commonly prescribed drugs—including 139 new to the market since the ninth edition—the book provides generic names (with pronunciation), trade names, therapeutic classes, general FDA approved therapeutic uses, and commercially available dosage forms/strengths. Regardless of their practice setting, pharmacy technicians will find the Pocket Drug Reference current, dependable, and useful.